Dams make these fine falls, thus “Two dam falls.” You can still show this article to your Momma without fear of retribution. 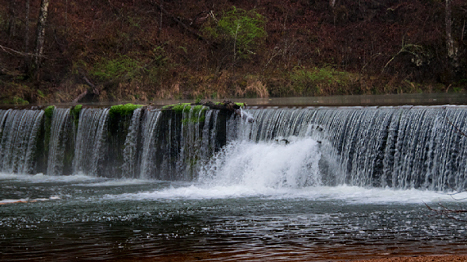 Falls at Rockbridge, Missouri created by a mill pond dam completed c. 1868. Before we venture further with the falls, I suggest you take a look at the Photo of the Week page at Corndancer dot-com where this story had its beginning, You will see different views of the falls and a neat country road. Take a look. We’ll wait here for your return. Waterfalls do not necessarily have to be naturally occurring to be cool, make nice sounds, and elicit “OOO” and “AHH” from enthralled onlookers. I was in the presence a couple of man-made falls weekend last which neatly support that theory. The other upside to man-made falls is that man had to get in there to make what ever it is that makes the falls, so it is generally a lot easier, with substantially lower exposure to chiggers, ticks, snakes, and grievous slips and falls, to sally forth and see the falls. 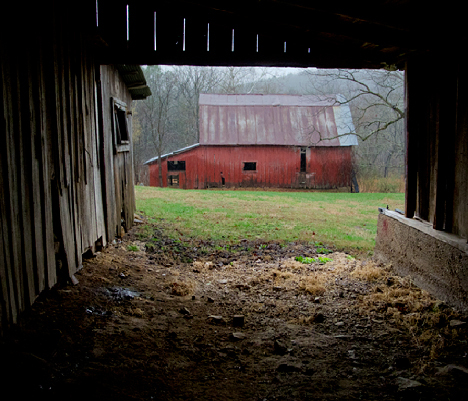 How to shoot a barn in the rain: Step inside an adjacent barn, out of the rain and fire away. Both structures are on the Mackey Place, part of the Rockbridge Trout Ranch at Rockbridge, Missouri. Around a quarter mile or so from, the Rockbridge falls, you will find the Mackey Place barns along with residential facilities for guests of the Rockbridge Trout Ranch. Not every place you stay offers you a fine old red barn in your yard. 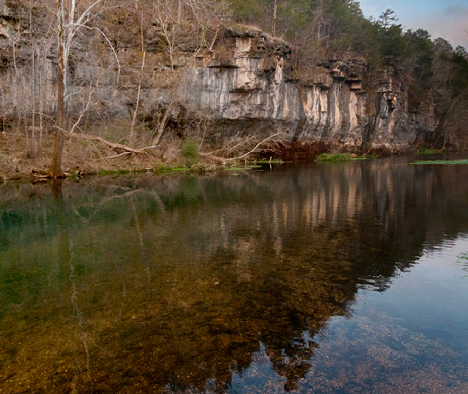 Bluffs near Rockbridge Missouri. Not long after I shot this image, a couple of anglers were casting flies which a few unsuspecting trout grabbed up. Tasty catches. 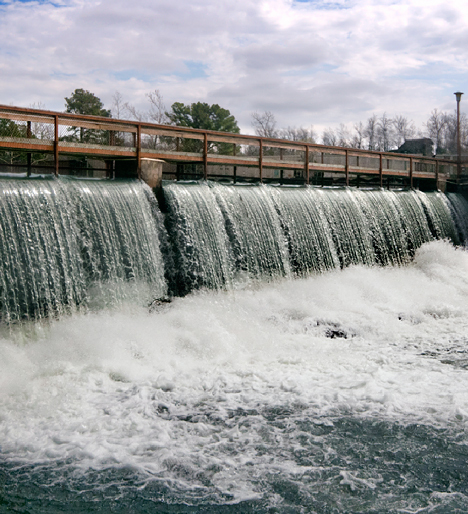 The waterfalls, the barns, and the bluff scene, (the dam controls the flow upstream), are prima-facie evidence that man can successfully interact with mother nature and live in harmony. Keep in mind that each of these aforementioned relationships began more than 100 years ago. If we could do it then, surely we can do it now. See an old store and station with a 35 cent per gallon gas pump, high-resolution pictures of the falls, an old house, a low water bridge, an old house and high resolution pictures of the falls on our Weekly Grist gallery. Non-fattening, rated G and high in natural content. You will not be tested on the content you observe. Click here if you missed the other links. Also, see “A great gravel road,” a previous Weekly Grist post from the same area. 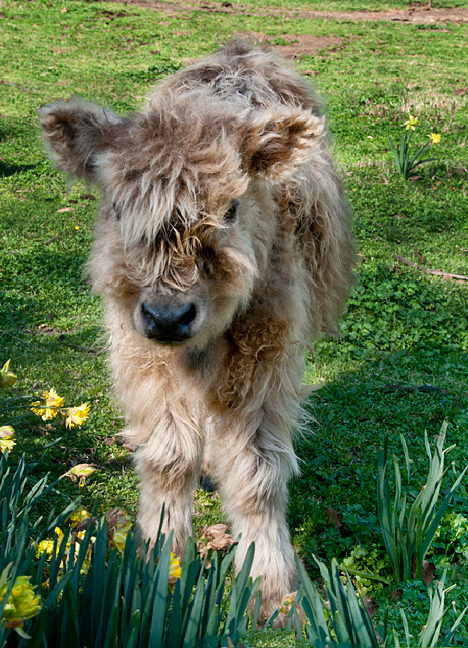 Mr. "Yet Unnamed," a Scottish Highland calf on Jimmy Michaels farm in Grant County, Arkansas is our friendly local symbol of spring. He does not care that the jonquils which line his pasture are on the downhill slide to anonymity pending their reappearance next spring. Thumbing its nose at a tsunami, radiation threats, a bloodthirsty raving maniac in Libya, and talking news heads, spring in the Delta is charging in like Jeb Stuart’s cavalry. It may be one of the few remaining commotions not influenced or guided by polls. The season is in full swing and marches on whether we notice or not. Critters are waking up, blooms are announcing their presence, new creatures are being born and hatched, and a scorched earth policy is enacted to be the lesser of two evils. And it is in our back yards. Before we continue this epistle, may I suggest that you take a look at the Corndancer Photo of the Week page where it all started. You will see more of the calf-of-the-week, a young Scottish Highland bull calf on Jimmy Michael’s farm. We’ll wait here. I had a lead for a new story and photo series which fizzled so being in the neighborhood, I checked out Jimmy Michael’s pasture for the calves he predicted earlier this year when he and I first met. He had spoken the truth. Considering the outcome, the whole thing was a fortuitous fizzle. Last Saturday, while returning home from my mother’s now former residence, I passed through a “controlled burn,” in Calhoun County, Arkansas south of Hampton. Why a controlled burn? Well, the theory is that we as humans are doing a far better job of preventing forest fires than we should. 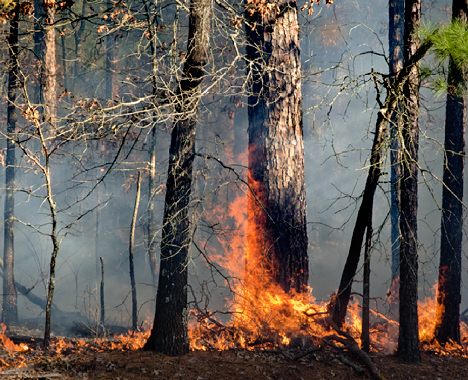 Fire is a natural component of forest life. If there is not an occasional small fire which consumes debris and forest detritus, the trash accumulates and becomes a giant fuel heap and when the fire does occur, it gets out of control and consumes everything. So, with a controlled-burn, we lose a little to keep from losing it all. This looks ominous, but it is a controlled burn, which cleans accumulated trash from a forest, hopefully to reduce the probability of a larger, more destructive fire. To crown the week, the moon was closer to mother earth than it has been for the last twenty years. To put things in perspective, gasoline was about $1.15 a gallon then and we griped. I was fortunate enough to be in a location which was not overcast and got a good look at and shots of the brilliant moon. Thank you Almighty! 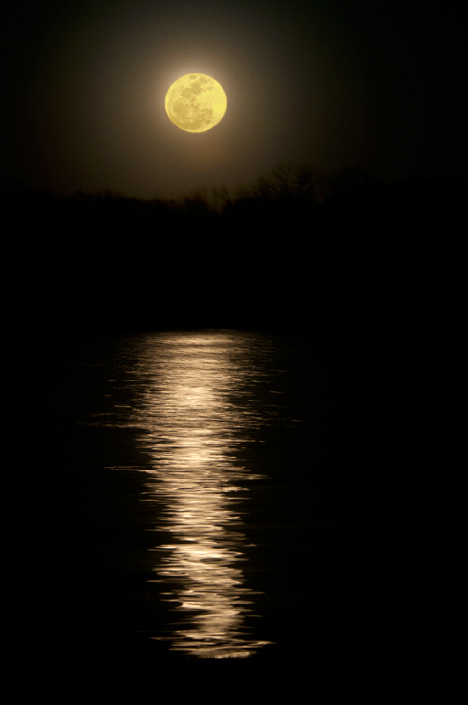 The moon reflects on the waters of Lake Langhofer at Pine Bluff, Arkansas. A fresh breeze rippled the surface giving a shimmering appearance to the reflection. Putting things in perspective, and if you thought the lead of this story was a bit calloused, you may want to consider this: As decent God-fearing individuals, we have a certain empathy for victims of the tsunami and the aforementioned raving idiot. As a balm to soothe this gloom and doom of those concerns, our higher power gives us calves, fires, and moons as relief from the aforementioned bummer conditions. Who are we to argue with such knowing magnanimity? Carpe diem. See our Weekly Grist gallery with more pictures, not published elsewhere. See more calves and cows, another moon, and another look at the fire. Lo-fat, high fiber, you can show it to your momma and you will not be tested on it. 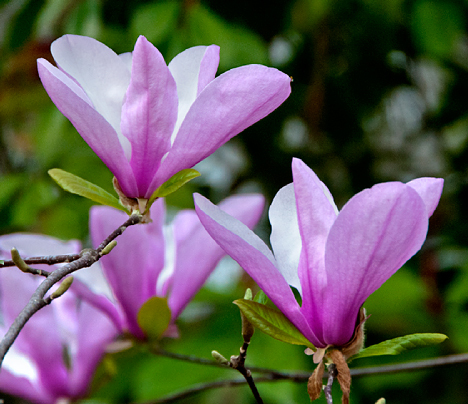 These tulip magnolia blooms grace a tree in the back yard of my across the street neighbors. While I was shooting some jonquils in her front yard, she informed me that she had a tulip magnolia tree in her backyard. Being the horticultural deprived and misinformed citizen that I am, I nodded in agreement. Later I discovered that it was what I have always incorrectly called a tulip tree. Some harbingers of our early spring are fading fast. 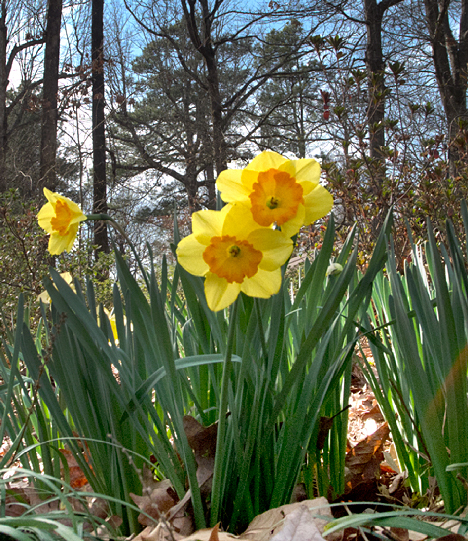 The jonquils, called daffodils by some, have reached their peak and are beginning to wind down. My camellia is already dropping petals. And there were a few floppy flowers on the tulip magnolia tree you see above. These posies were fooled by a few unseasonably warm days in January and February. Before we delve further into this epistle, I should advise you that it had its beginnings on the Photo of the Week Page at Corndancer dot Com. Go there to see more flower pictures and learn about attendant seasonal grumbles. We’ll patiently wait here for your return. No spring is complete without 'em: Spring Beauties. These blooms are no more than 3/8" inch in diameter.Thousands of these tiny flowers populate most southern yards. 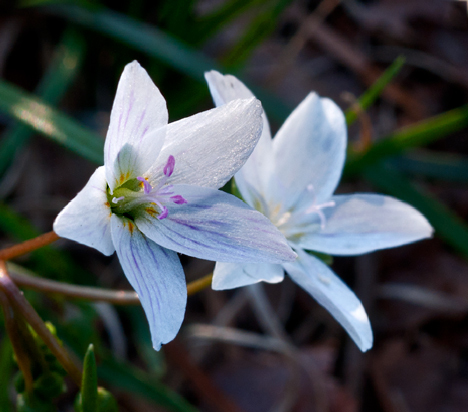 One of the sure signs of spring, are Spring Beauties, a tiny white flower with gossamer purple variegation. No self-respecting yard is complete without a few. Some are blessed with many. My neighbor to the west has one of those yards. My dogs who favor his turf for their business may contribute to this healthy growth of spring beauties. It is hard to argue with the results. Other dogs in the neighborhood, sometimes even his, exact proper revenge with similar deposits on my premises. But his flowers are still better. Jonquils from ground level, a cat-level view. My cats like this flower bed. Our bare deciduous trees are clearly visible behind these jonquils shot from ground level. They are building up a head of steam to inundate us with pollen, our annual reminder that the shade trees we love in the summer come at a price. Sometimes the pollen is so thick you have to turn on wipers to knock it off your windshield. How quickly we forget while sitting in the shade of a half-dozen towering oak trees that we endured a bit of prior inconvenience. That forgetting mechanism also works well for other temporary hiccups. This week we are featuring 18 posy pictures in our Weekly Grist Gallery. We usually shoot more than we can use so we put ’em in a handy gallery for you to ogle. See more jonquils, some pansies, another camellia, more spring beauties, forsythia, tulip magnolias, and more. And, this is an on-line gallery that you can show your Momma. Click here if you missed the other links. Lo-carb and stress relieving.